This photograph is not badly faded, but it is yellowed and severely tarnished. There's a bluish sheen to the blacks, and much of the print has a low-contrast, milky haze over it. The strong paper texture detracts from the photo. 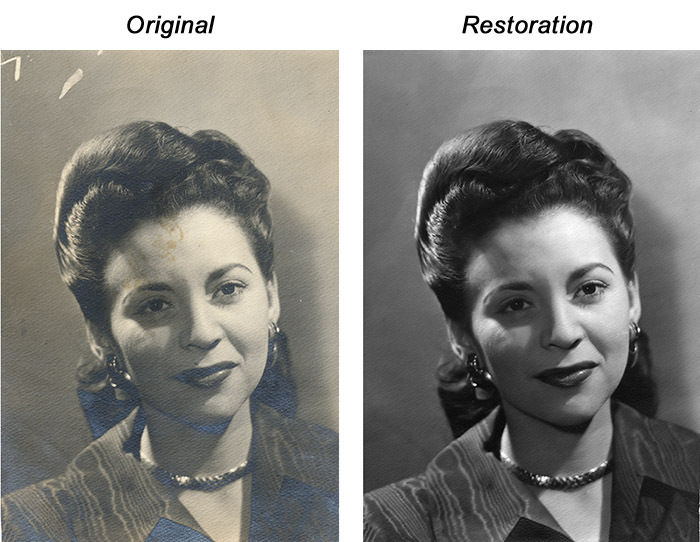 I repaired this photograph by first eliminating the tarnish with a masked curves adjustment. Then I erased the small stains and overall yellowing. Finally I filtered out most of the paper texture, leaving only enough to give the finish a bit of a "tooth." A complete description of how I performed this restoration is in my book, Digital Restoration From Start to Finish and online in this book excerpt.